In a country often referred to as the business hub of the Middle East, bringing a new person into the world gave parents plenty to keep them busy. For each birth, parents were required to visit a number of different government agencies to collect the necessary legal documents such as a birth certificate and a national ID card. 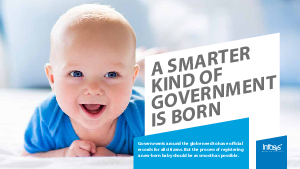 But a new emphasis on 'Smart Government' aimed to transform the experience for the benefit of all citizens.